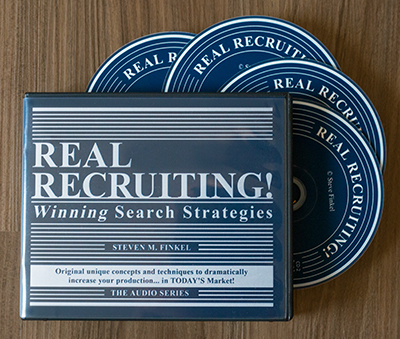 Here’s what you’ll get in Real Recruiting! The Audio Series, 42 lively engaging 15-minute modules of specific advanced-level techniques to immediately increase your production in today’s market! A MAJOR key to exploding your billings is a greater number of cooperative Hiring Authorities who want to work with you. To sell your services much more effectively, first clarify why you are genuinely different from your competitors. Then, persusively explain why your candidates are genuinely superior to those who can be found through other means. Additionally, you must persuade the Hiring Authority – not HR – why he or she must move quickly and work with you to sell the candidate on the merits of the opportunity. Then, he must extend good offers promptly. And finally, you must receive FULL information if you are to select the search properly. Can Hiring Authorities be influenced in all these areas? Indeed they can! Working on the right assignment guarantees increased fees. Each vibrant chapter will provide you with new tools to maximize your income. More candidates of higher quality means many more fees! An over-emphasis on the internet leads to candidates easily obtained by your client’s HR department or by your web-focused competitors. Only a “balanced” approach with an effective blending of non-internet sourcing can maximize your ability to identify uniquely qualified candidates. Learn how to balance your approach – and find many more in-demand quality candidates. That’s exactly what you’ll get in this revolutionary “script-oriented” series. Brisk real-time role-playing demonstrates each technique. After implementing this specific and detailed material, you will NEVER have to worry about quickly finding quality candidates again! The better you recruit, the more money you’ll make. This section takes you through the most comprehensive and effective recruiting techniques in today’s market. From the initial approach to presenting the opportunity and then to rebuttals, from leaving voicemail messages to preventing turndowns and counter-offers, you will substantially increase your recruiting skills. Recruiting is the foundation of what we do! Improve your skills in these specific and profitable chapters, and watch your production soar! Have you ever been unable to work directly with the hiring authority? Have you ever been unable to identify a qualified candidate or failed to recruit the best candidate? Have you ever had a client let you down with a poor offer or a delay? Have you lost fees to counter-offers or turndowns? When you own Real Recruiting! The Audio Seminar, you will leave these problems behind and your new strengths will enable you to catapult your billings to permanently higher levels. This is the product you absolutely must have! This comprehensive series is available in CD format or downloadable to two devices. Real Recruiting! The Audio Seminar, will sell for $295 plus postage. But for the first month, we are making it available for only $250. You’ll see thousands of times your investment from dramatically increased production! For a Table of Contents, click here.